Espresso Martini Jelly Shot - the high octane version . . . Recently we had a lively discussion about cocktails with a very charming London attorney (I get barrister and solicitor mixed up, but at any rate, we shall refer to him as Mr. F.). Mr. F.'s favorite cocktail is the Espresso Martini, and his rationale for this choice made perfect sense. An Espresso Martini is most importantly delicious, however, as a secondary consideration, the cocktail is coffee-based, and therefore caffeinated - very important if one is running on empty by nightfall. A very efficient libation, indeed! Recipes for the Espresso Martini abound, some with Bailey's or cream added, and some "black". As you can see, we like a little variety . 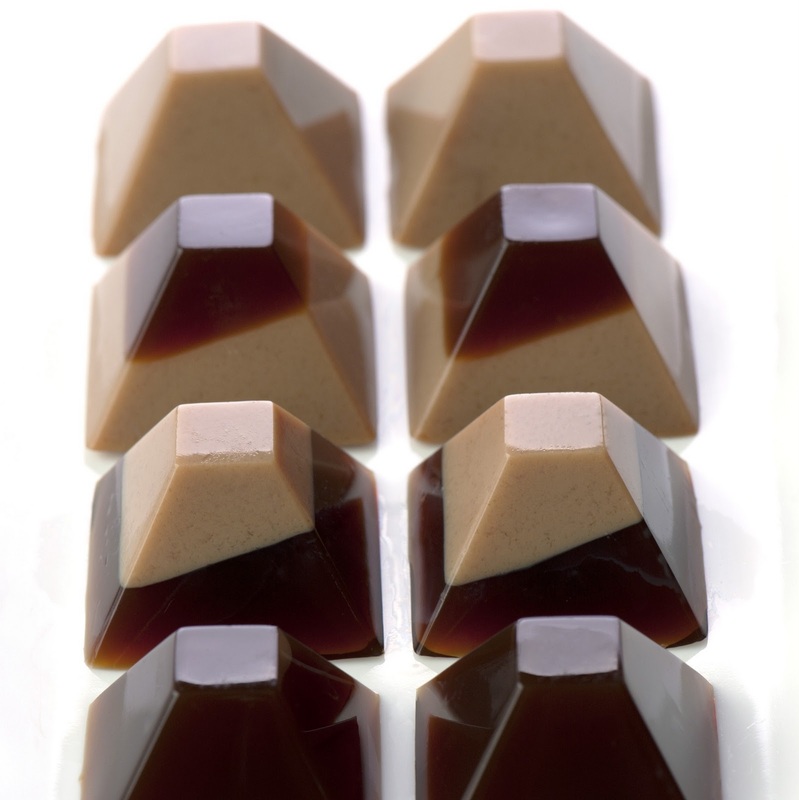 . .
Also, the coffee/espresso is the star of the show in this jelly shot - make sure to brew up some of the good stuff! Thanks Mr. F. for the jelly shot inspiration! Prepare a flexible silicon pyramid mold (we like this one from Kerekes) by spraying lightly with PAM cooking spray, or wiping each mold cavity with a little vegetable oil. Follow by wiping each mold cavity with a clean paper towel. This method will leave the slightest reside which will aid in un-molding the gelatin without affecting the taste or appearance of your gelatin. Place the mold on a stable, movable flat surface, such as a cookie sheet or cooling rack (make sure the pan or rack fits into your refrigerator). Pour coffee/espresso into small saucepan. Sprinkle with gelatin and allow to soak for a minute or two. Heat over very low heat, stirring constantly, until gelatin is dissolved (about 5 minutes). Remove from heat, and add the vodkas and Kahlua, stirring well to combine. Taste and add agave nectar/simple syrup if desired. If making dual-level jelly shots, divide the jelly shot mixture equally into two bowls. Add 1-2 tbsp Baileys to one of the bowls. Spoon a teaspoon of the Baileys mixture into 4 of the mold cavities, then spoon a teaspoon of the espresso jelly shot mixture into 4 additional cavities. Refrigerate until set, about 3 minutes, inverting the mold on one end to create an angled layer. When set, remove from refrigerator and fill with the alternate jelly shot mixture. You will have 7 mold cavities remaining, fill these with the remaining espresso and the Bailey’s mixtures. Refrigerate until fully set, several hours or overnight. To serve, unmold. *these can of course be set in a 8"x4" loaf pan and cut into squares for serving. You may wish to reduce the gelatin to 2 envelopes if setting in a pan - the extra gelatin is vital for smooth unmolding, but not really necessary otherwise.